Many challenges in longitudinal, in-home cardiac output measurement studies arise from the unstructured setting. Senior participants use different types of beds and pillows and sleep in varying body positions. Some are more restless than others; health conditions and medications can affect sleep patterns. Some participants sleep with their pets. We have recently developed a hydraulic bed sensor system as shown in Fig. 1. It contains four water tubes with the pressure sensors at the end. Fig. 2 (a) shows a typical Ballistocardiogram (BCG) signal captured from the system. 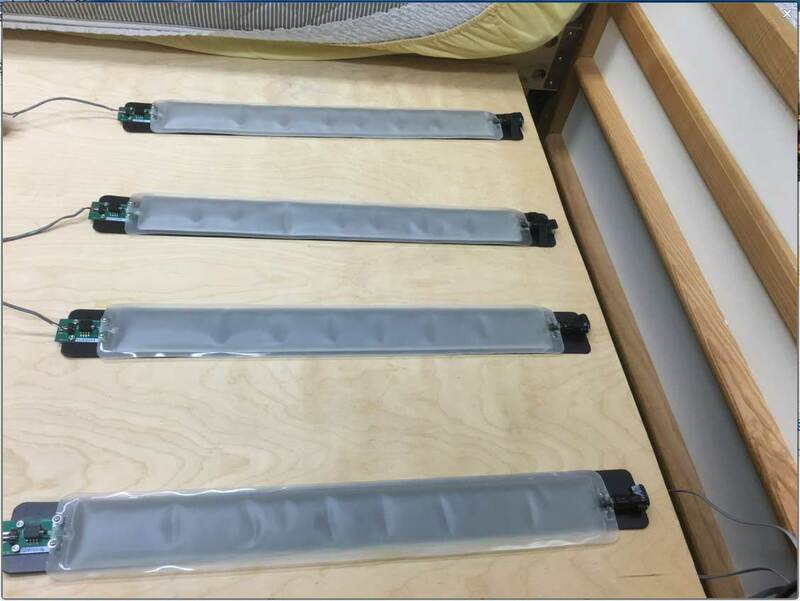 This approach, with the bed sensor positioned under the mattress, provides a method for continuous non-intrusive heart rate monitoring in an unstructured natural living environment. The hydraulic transducer is also attractive due to the low cost, flexibility and ease of operation. The BCG reflects the repetitive motions of the human body arising from the sudden ejection of blood into the arteries with each heartbeat. A careful analysis and processing of the BCG signal provides the respiration rate, heart rate, and bed restlessness for health care monitoring as shown in Fig. 2(b) and (c). The hydraulic bed sensor has been installed in many home of older adults. We have also created a web interface to visualize the results. Based on the estimation of heart rate, respiration rate and restlessness, we generate alerts to clinical staff when there is a clinically relevant event that may indicate a change in health status. D. Heise and M. Skubic, “Monitoring Pulse and Respiration with a Non-Invasive Hydraulic Bed Sensor,” In Proc. of the Intl. Conf. of the IEEE Engineering in Medicine and Biology Society, Buenos Aires, Argentina, August/September, 2010, pp. 2119-2123. D. Heise, L. Rosales, M. Skubic, and M.J. Devaney, “Refinement and Evaluation of a Hydraulic Bed Sensor,” In Proc. of the Intl. Conf. of the IEEE Engineering in Medicine and Biology Society, Boston, MA, August, 2011, pp. 4356-4360. 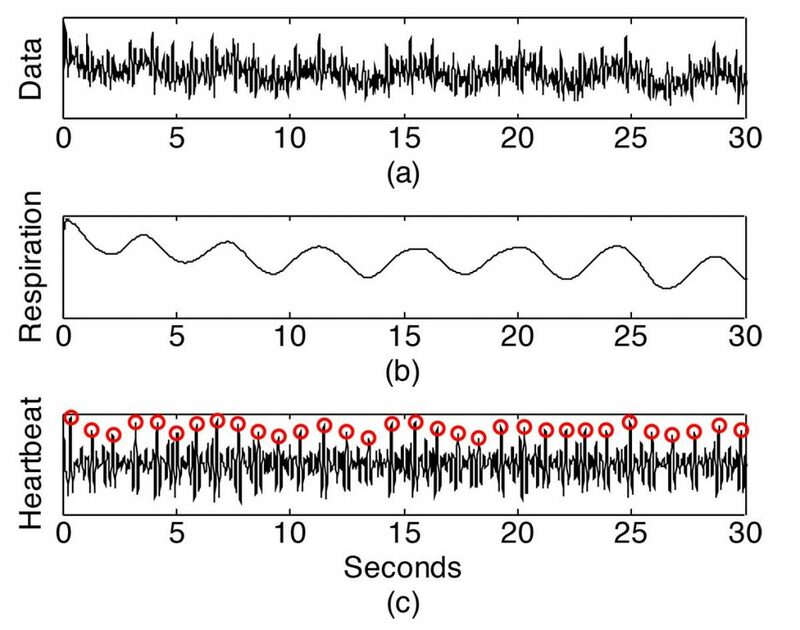 L. Rosales, M. Skubic, D. Heise, M.J. Devaney, and M. Schaumburg, “Heartbeat Detection from a Hydraulic Bed Sensor Using a Clustering Approach,” In Proc. of the Intl. Conf. of the IEEE Engineering in Medicine and Biology Society, San Diego, CA, August/September, 2012, pp. 2383-2387. B-Y. Su, K.C. Ho, M. Skubic, and L. Rosales “Pulse Rate Estimation Using Hydraulic Bed Sensor,” In Proc. of the Intl. Conf. of the IEEE Engineering in Medicine and Biology Society, San Diego, CA, August/September, 2012, pp. 2587-2590. David Heise, L. Rosales, Mary Sheahen, Bo Yu Su, and Majorie Skubic, “Non-invasive measurement of heartbeat with a hydraulic bed sensor,” in Proc. IEEE International Instrumentation & Measurement Technical Conference, Minneapolis MN, May 2013, pp. 4356-4360. Lydon K, Su B-Y, Rosales L, Enayati M, Ho KC, Rantz M, and Skubic M, “A Simple and Robust Pulse Rate Estimation Method Using a Hydraulic Bed Sensor,” In Proc., IEEE Conf of the Engineering in Medicine and Biology Society, Invited session, Milan, Italy, August, 2015. Jiao C, Lyons P, Zare A, Rosales L, and Skubic M, “Heart Beat Characterization from Ballistocardiogram Signals using Extended Functions of Multiple Instances,” in Proc., IEEE Conf of the Engineering in Medicine and Biology Society, Orlando, FL, August, 2016. Yang J, Keller JM, Popescu M & Skubic M, “Sleep Stage Recognition using Respiration Signal,” in Proc., IEEE Conf of the Engineering in Medicine and Biology Society, Orlando, FL, August, 2016. L. Rosales, Bo-Yu Su, M. Skubic, and K.C. Ho, “Heart Rate Estimation from Hydraulic Bed Sensor Ballistocardiogram,” Journal of Ambient Intelligence and Smart Environments, in press.